Several vendors debuted some really cool stuff last year at Star Wars Celebration VI and as always, ThinkGeek brought their game face and blew them all away. I’m only just now starting to get to play with these new toys, so here is the list of my favorites! First up on my list, is the AT-AT Plush Utility Bag. This was love at first sight for me and I happily carried one around the convention. My son found a new use for it as a puppet. More than one child stopped to play with him as he walked “AT-ATY” the AT-AT around the convention floor. The inside is spacious enough to hold your wallet, phone, and a few other things. The head of the bag comfortably fits my credit cards and change. Something else that fits in my AT-AT bag is my Han Solo Business Card Holder. This little guy packs a wallop and in my opinion could be used as a weapon. With a push of the creatively hidden button on the side, the bottom pops out to expose your business cards. It doesn’t hold that many cards, but the impression you leave after using it, makes it worth it. The edges are a little sharp, so this is not something you want to hand over to a child, but it makes a great little display piece or fully functioning business card holder. If you want to take a trip back to your childhood, check out the Scalextric Star Wars Race Track. I’ve checked out the Death Star Attack set and it was pretty fun. If you’re a fan of the old-school slot cars, then I highly recommend this one. The interesting part about it is you don’t race the cars. The point of the game is to knock the other car off the track. In fact, the X-Wing (Death Star Attack set) is too wide to pass Vader’s TIE Fighter. The first person to knock the other player of the track wins. My Inflatable R2-D2 R/C Droid is about as close as I’m going to get to the real thing for awhile. This little guy inflates to around 25 inches tall and is pretty easy to get up and running. On top of that, he can go down stairs and not topple over, something the real thing can’t even do. My only complaint about this product is that it’s extremely noisy when you play with it on a tile floor. I don’t have much carpet in my place so I can’t tell you how well it work on a different surface. The remote only has about a 25 foot range, which is just enough for my little guy to play with him. The Boba Fett bathrobe is the perfect accessory for any fan of the famous bounty hunter. It’s just as comfy as it looks too! The armor pieces are a nice touch (literally) and are silky smooth. My son thinks it looks really cool and loves the hood on the back. Of everything I’ve been able to check out, my favorite has to be the AT-AT bag. It’s a neat way to show your love of Star Wars and it’s comfy to carry around. It could almost double as a pillow (if you don’t put anything too hard in it). 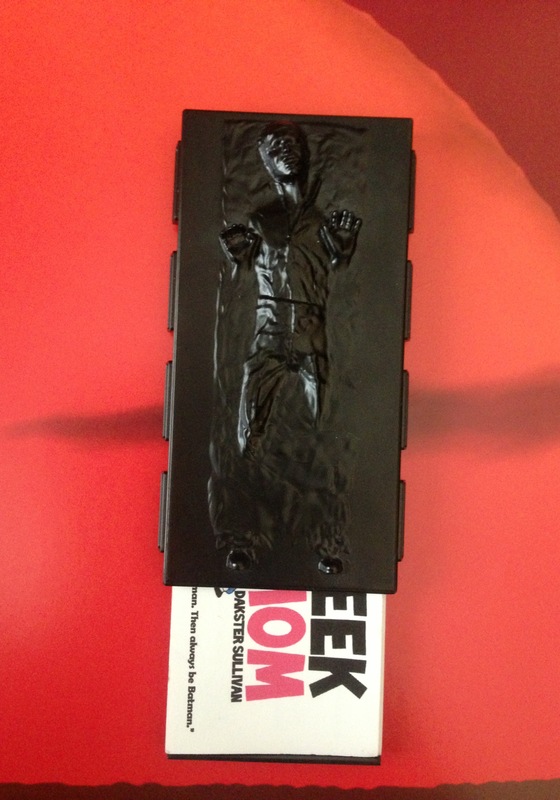 For more awesome Star Wars and otherwise cool geeky stuff, check out ThinkGeek’s website. In exchange for my time and efforts in reporting my opinion within this blog, I received a free review sample. Even though I receive this benefit, I always give an opinion that is 100% mine. Let’s face it. Star Wars is cool. Would you expect me to give anything other than a positive review?